Now you can have all of the U.S. physicians and other healthcare providers – right on your own computer. CarePrecise brings you the complete database of the more than 5.8 million U.S. healthcare providers in a form that's ready for use on ordinary desktop and laptop computers. CarePrecise powers healthcare industry research, web apps, billing and claims, credentialing, audits and marketing to American physicians and other healthcare providers, with the most complete list of healthcare professionals available anywhere. CarePrecise Platinum contains NPI, specialty and facility type codesSpecialties are reported by providers using Provider Taxonomy Codes. 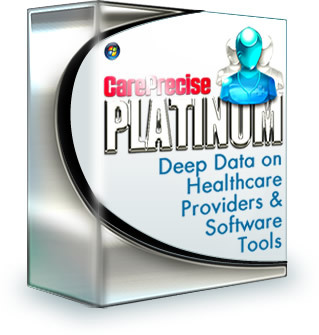 CarePrecise datasets include both the taxonomy code and the specialty or facility description in plain English. Click the link to see current specialties., UPINsThe UPIN (Unique Physician Identification Number) was a six-character code assigned and used by Medicare to identify physicians between 1985 and 2007. A directory of UPINs was available through that time (the UPIN Registry), but CMS discontinued the lookup service as of May 23, 2008, when the National Provider Identifier (NPI) superseded the UPIN. However, the UPIN is still used to match legacy physician data., Medicare/Medicaid numbers, state license numbers, phones, faxes, multiple practice addresses, and much more for physicians, dentists, pharmacies, clinics, hospitals, nurses, in fact, all HIPAA-covered U.S. healthcare practitioners. It includes data from the PECOS databaseThe federal database containing information on healthcare providers who are eligible to bill Medicare., banned providers databaseA federal database maintained by the HHS Office of Inspector General containing information on providers who have been barred from billing Medicare due to fraud or controlled substance conviction, patient neglect or abuse, and other infractions. and the complete NPI registryThe Centers for Medicare and Medicaid Services (CMS) maintains the National Plan and Provider Enumeration System (NPPES) database. All healthcare providers who are HIPAA covered entities must obtain a National Provider Identifier (NPI) by reporting their information via the NPPES, and updating it within 30 days of changes. This represents virtually all of U.S. physicians, hospitals, and other providers who accept insurance or are associated with a hospital. CarePrecise Access Complete includes every NPI record., the US Department of Commerce, as well as other sources, creating a single database from multiple data silos. Data is updated monthly, and subscriptions are available. Over 7.5 GB of healthcare provider data—formatted to use on your desktop or laptop computer. We include historical information going back to 2005, so you can look up providers who are no longer practicing, or may be temporarily deactivated. This and other exclusive CarePrecise features make our provider data products the best value available anywhere. Our customers are America's most respected organizations. CarePrecise medical provider information is based on data from the U.S. federal healthcare provider data, the Medicare system, and the HHS Office of Inspector General, and is delivered as a relational database, with hundreds of source fields of data per provider record. Providers are required by law to be listed in this data, and to update it within 30 days of any changes. Plus with CarePrecise Gold: Wealth codes, geo locator codes, counties, urban/rural status, and tools for precise market segmentation, proper casing, import/export. With CarePrecise Platinum, all that plus practice group and hospital affiliations for individual providers, medical school, graduation year and more. Call (877) 782-2294 and let us answer your questions, or to arrange a live demo.